Soup’s are the easiest meal you can make, especially when you already have a roasted chicken or turkey. This year hubs wanted a turkey all to himself. Just a little bird, eight pounds. We ate most of the white meat and I decided to make turkey soup with the dark meat and bones since it was snowing today. Yes, pure comfort food. The wood stove is crackling and the soup is simmering today, while I bake an assortment of desserts for Thanksgiving. 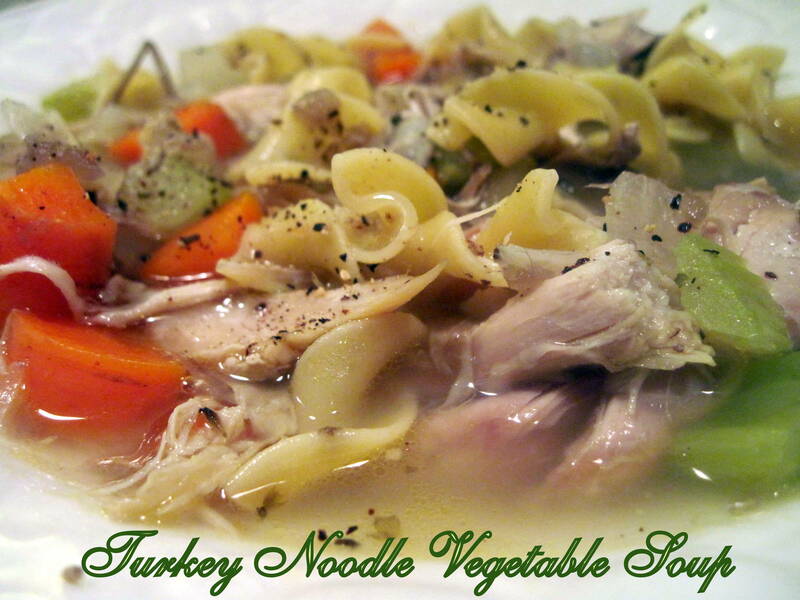 Yes, it is a good day when I have been baking all day and we can actually have supper ready with a delicious comforting bowl of Turkey Noodle Vegetable Soup. In a large soup pot, cover turkey bones and meat with water. Cover and boil for 1 hour over medium heat. Broth should look dark after boiling for 1 hour. Remove from heat. Chill overnight or let cool. Drain liquid into bowl, remove turkey from bones. Shred turkey, add back to broth. In another pot, add olive oil and chopped vegetables, saute for about 4-5 minutes. Add vegetables to turkey and broth, boil until veggies are softer, about 8-10 minutes. Add noodles and cook al dente, about 7 minutes. Add salt and pepper to taste. Serve hot. That sounds like a delightfully comforting meal. I love leftovers and love thinking up new ways to use them.